Raccoons live and thrive in urban and suburban areas; if you’re a resident that happens to live in one of these communities, you’ve probably seen a raccoon or two going through your garbage cans. These wild animals tend to go after any food scraps or food sources they can, which makes your trash cans a suitable environment for roaming. If you’re looking for a solution to your raccoon problem, ask yourself this: What can I stop or start doing to get rid of these small animals? Is there a pest control method I can start using? Should I look into creating a natural raccoon repellent? We think you can stop these raccoons from getting into your yard and you should start on a homemade raccoon repellent right now. To start, you’ll want to gather ingredients like hot pepper, cayenne pepper, and a bottle of hot sauce. Then, you’ll need to find the best solution to implement raccoon control in your backyard and your trash cans. We have all the research you’ll need readily available to you to create the perfect animal repellent; pick your poison and get rid of those nuisance animals today! If you’re looking for a simple solution to your raccoon problem, create what’s called a hot sauce spray; this recipe will work wonders but keep in mind that if it rains, you’ll have to reapply it to the vegetation to continuously keep the little animals away. Mix the hot sauce and dishwashing soap in a large spray bottle. Spritz the DIY raccoon repellent spray onto the plants surrounding your home. You can also spray areas like your garden, and your trash can lid. Adding dishwashing soap to the hot sauce causes it to stick to the vegetation easily. Raccoons do not like anything spicy, but you’ve probably already figured that out. While this concept may be like the last option offered, it will differ in ingredients and application. Cook the ingredients in boiling water for approximately twenty minutes. Let the homemade pepper spray cool, and then strain it through a cheesecloth. Apply the DIY raccoon repellent spray onto any areas you suspect the raccoons may go. This recipe will stop squirrels, raccoons, and most other wildlife from coming near your home. Keep in mind; you’ll have to reapply the spray approximately every three days. One of the best animal control methods to implement when keeping raccoons away is to install an electric fence around your home. Though these fences may be more on the expensive side, they’re well worth the cost if you’re aiming to protect your vegetable garden and vegetation. Once the raccoons touch the fence, they won’t be trying to get past it to get into your trash bags and vegetable gardens anymore. If you’d like to go for the more affordable route, you can purchase a fence specifically made only to protect your garden. There’s a pattern going on here, and it seems to have to do with spicy ingredients. Though most of these recipes may leave a strong odor in the air, they are still well worth putting up with to see the wild animals go away. Combine the ingredients listed above and pour the mixture into a spray bottle. Spray the mixture over vegetation, bushes, fruit trees, and other areas you are concerned about for a heavy-duty solution. There are several different ways ammonia can be used to rid your home of raccoon damage. You can place ammonia-soaked rags near the entrance of your raccoons’ nests. You can also spray ammonia near the areas where you’ve seen raccoons lingering. If you need more options, you can sprinkle ammonia around the inside of your trash can lids. If you’ve spotted a raccoon or two around your house, head to your local sporting goods store to purchase predator urine. This method will trick the raccoons and make them think that a predator is nearby. Often, this will scare the wild animals away. Specifically, you’ll want to look for urine from wolves, coyotes, mountain lions, or bobcats. Raccoons cannot stand the strong odor of mothballs. If you’ve discovered that there are raccoons nesting or roaming in areas like your attic, near a tight crawl space, or around your wood piles, place a few mothballs in the area. Remember, if the mothballs are left there for a long time, the chemicals will start to seep into the house. If you have pets or children, you’ll want to be very cautious when using this option, as they could potentially ingest the mothballs, which can create toxic reactions. Many homeowners may fear this option, but you should still be aware that it’s possible. 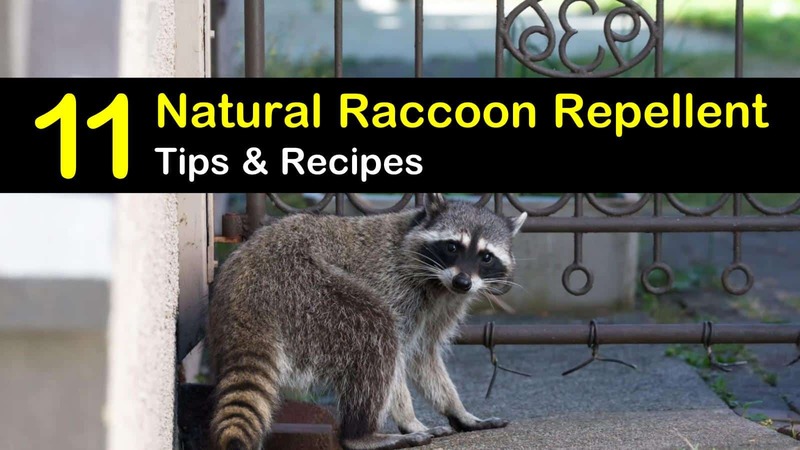 Purchase a live raccoon trap or create one using online tips and tricks. Raccoons are attracted to foods such as marshmallows and tuna fish, so you’ll want to have a trail of either of these leading to the trap. After you have them caged, you’ll be able to set them free far from your home. Raccoons love meat, which means they look at chickens as their pet food; because of this, you’ll want to secure your chicken coop. These wild animals know how to open many latches, so you’ll want to attach a padlock to windows and doors leading to your chickens. You may wish to purchase some durable wire mesh to keep the raccoons from breaking their way into the coop, too. Build a roof for your coop so that the little animals can’t climb up the fencing to get in. If you’ve secured the coop with items like bungee cords and padlocks, the raccoons will likely give up and move onto the next household with chickens. If you have sweet corn growing in your gardens, or if you have bird seed and bird feeders you want to protect, you’ll need a way to keep the raccoons away; how about scaring them? Implement the option you find best for your yard, and you’ll be on your way to a raccoon-free home. You can purchase a scarecrow, use motion sensor flashing lights, or get solar-powered repellents to keep them away. Be careful with this suggestion, as it may only last for the first few attempts. You may want to start planning your next move. One of the best ways to keep raccoons away from your yard is to clean up after yourself; don’t let any loose trash sit on your lawn. For instance, if you have a picnic in the backyard, don’t leave the blanket and basket outside, bring them back inside immediately. Also, keep your trash cans closed and don’t let the trash overflow the can. Purchase another garbage holder if you must. It’s time to get those raccoons away from your home! After learning how to keep raccoons away using raccoon trapping methods, flashing lights, and natural deterrents, you’re ready to say goodbye to those wild animals for months. Be sure to target all the entry points with your newly found raccoon deterrent recipes, and you should be good to go. We hope you enjoyed reading our advice on natural raccoon repellent recipes. 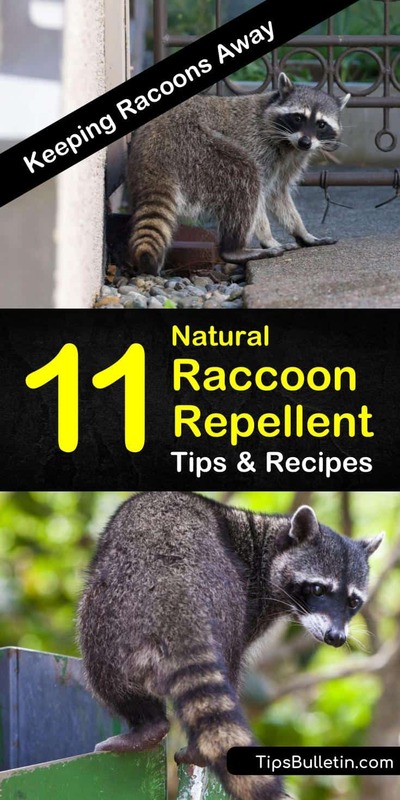 If you did, please share our homemade raccoon repellent tips and tricks on Facebook and Pinterest with your friends.